EAST LANSING---To accommodate the future availability of arenas used to host the Michigan High School Athletic Association girls and boys basketball championship weekends, the Representative Council approved during its Fall Meeting on Dec. 1 in East Lansing a switch in schedules for girls and boys basketball for the 2018-19 season. Currently, and since girls basketball season moved to the winter from fall in 2007-08, the Girls Basketball Semifinals and Finals have been played first followed by the Boys Basketball Semifinals and Finals a week later, usually during the final two weekends in March. Both utilize a format of Semifinals on Thursday and Friday and all four Finals on Saturday. However, in March 2019, Michigan State University’s Breslin Center will not be available for the traditional MHSAA boys championship weekend because of the possibility of the MSU women’s basketball program hosting the first two rounds of the NCAA Tournament. 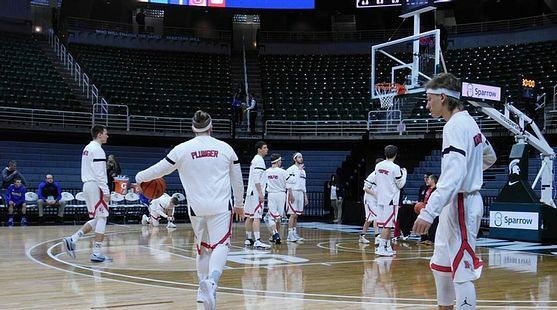 Breslin Center is the only available arena in Michigan large enough to host the boys Semifinals and Finals; for that reason, the Council voted to switch the schedule for that season only so the boys tournament can finish at Breslin during the weekend of March 14-16, 2019. The girls Semifinals and Finals, played most recently at Breslin as well, are moving to Calvin College’s Van Noord Arena for this 2017-18 season and with this switch will be played at Calvin College during the weekend of March 21-23, 2019. This switch in calendars for 2018-19 also includes a switch of starting dates for when practices may begin and first games played. Typically, practices for both begin girls and then boys during the first two weeks of November, with girls basketball teams allowed to play their first games the Monday after Thanksgiving followed by the first boys basketball games a week later. In 2018-19, the boys will begin practice first and the first boys basketball games will be able to be played that Monday after Thanksgiving, followed by the first girls games a week later. The boys District and Regional tournaments also will start a week earlier than those for the girls. Roberts also noted that this switch, at this time, will be for only the 2018-19 season. The current NCAA calendar for 2019-20 would allow for the MHSAA girls and boys tournaments to move back to their traditional weekends with Semifinals and Finals played at a Division I college venue, although that is not decided. Other options will be examined during 2018. Earlier this fall, MHSAA staff surveyed school administrators on their preferences for regular season and MHSAA tournament schedules, discussed possible changes during UPDATE meetings across the state and solicited Requests for Proposals from sites to host both the girls and boys Semifinals and Finals.